SOS: Is Climate Change Suffocating Our Seas? 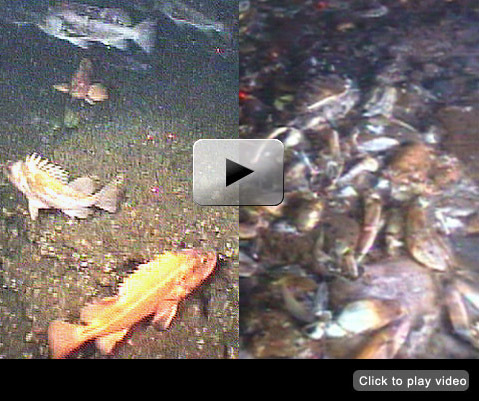 Footage taken by a robotic submersible shows a reef at Cape Perpetua, Oregon, before and after the invasion of a dead zone in 2006. New Ways of Taking the Pulse of Oregon's "Dead Zones"
Yet another ecological scourge may earn a place on the ever-lengthening list of problems potentially caused by climate change: the formation of some so-called "dead zones"—huge expanses of ocean that lose virtually all of their marine life at depth during the summer. The Earth currently has more than 400 oceanic dead zones, with the count doubling every decade. A single dead zone may cover tens of thousands of square miles. Dead zones form where microscopic plants, known as phytoplankton, are fertilized by excess nutrients, such as fertilizers and sewage, that are generated by human activities and dumped into the ocean by rivers, or more rarely, where they are fertilized by naturally occurring nutrients. The result: blooms of organic matter that ultimately decompose through processes that rob the ocean of life-sustaining oxygen. Animals that fail to flee dead zones either suffocate or suffer severe stress. One of the Earth's relatively few naturally formed dead zones has long been seasonally perched in the deep waters of the continental shelf far from the coast of the Pacific Northwest. This low-oxygen, or "hypoxic," zone has apparently historically remained stationary and is believed to be caused by large-scale processes that are unrelated to human activities or local winds. But in the summer, northerly summer winds work together with the Earth's rotation to push oxygenated surface water offshore; this coastal water is replaced by low-oxygen but nutrient-rich waters from the depths of the continental shelf in a process known as upwelling. (See illustration.) Once this nutrient-rich water reaches the ocean's sunlit layers, it fertilizes blooms of phytoplankton. Resulting phytoplankton blooms feed the food chain and thereby help make the Pacific Northwest one of the nation's most productive fisheries. But the decomposition of unconsumed, sunken phytoplankton promotes the formation of deep pools of low-oxygen water. Periods of upwelling-favorable northerly winds may be interrupted by relatively short periods of southerly winds during the summer and by longer periods during the fall. These southerly winds work together with the Earth's rotation to drive oxygenated surface waters back towards the shore and to drive low-oxygen bottom waters away from the shore in a process known as downwelling. Periods of strong downwelling have traditionally occurred frequently enough to flush the low-oxygen pools from the continental shelf, and thereby prevent them from expanding all the way to the shore. Pools of low-oxygen water have expanded from the continental shelf to near-shore waters off Oregon and Washington every summer since 2002; the close proximity of these dead zones to the shore had never been reported before that year. Coastal dead zones have been more hypoxic than the low-oxygen pools located on the continental shelf, with some coastal areas periodically completely stripped of their oxygen. Areas of hypoxia that have seasonally dotted the Pacific Northwest coast, "have been connected to one another by a ribbon of low-oxygen water that runs along the coastal sea floor," says Barth. So far, the most hypoxic year for the Pacific Northwest was 2006, when the research team discovered a dead zone off Newport, Oregon that sprawled over almost 1,200 square miles, and pressed so close to the shore that "a baseball hit from Highway 101 during the summer could land in it," says Barth. Covering up to 80 percent of the water column and lasting for an unusually long time (four months), "this dead zone transformed a teeming habitat into a fish-free zone that was carpeted with dead crabs, worms, severely stressed anemones and sea stars, and what looked like potentially noxious bacterial mats," says Barth. 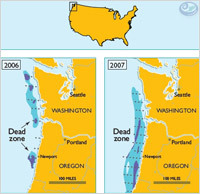 During the summer of 2009, dead zones characterized by severe hypoxia formed near the seashore on the mid-to-inner shelf in Oregon's coastal waters; they were about average in size and duration. Barth says, "we also saw the now-classic ribbon of low dissolved oxygen water near the seafloor extending along the coast. "However, no zero-oxygen areas like those that formed in 2006 were observed. Reductions in the oxygen content of low-oxygen water that upwells from the continental shelf. Prolonged and intensified upwelling along the continental shelf that has, in turn, been caused by periodic increases in the strength of northerly, upwelling-favorable winds and decreases in the frequency of southerly, downwelling-favorable winds. During periods of prolonged upwelling, each successive wave of upwelling fertilizes more phytoplankton blooms. As these blooms decay, the continental shelf's low-oxygen waters expand, lose more oxygen and move closer to shore. The more prolonged and intense the downwelling-favorable winds and resulting upwelling are, the more severe the hypoxia becomes. Hence, the highly hypoxic year of 2006 was dominated by particularly strong upwelling-favorable northerly winds, particularly infrequent downwelling-favorable southerly winds and particularly large accumulations of phytoplankton. By contrast, the summer of 2009 was marked by periods of southerly downwelling-favorable winds that helped dissipate low oxygen conditions. "Therefore, the hypoxia of 2009 was neither as extreme nor as long-lasting as that of 2006. What is the underlying cause of the decreases in the oxygen content of subsurface offshore waters and changes in coastal winds? One theory points to large-scale cyclic changes in oceanic circulation and atmospheric conditions that have hit the Pacific Northwest every 10 to 20 years. But Barth says evidence that these phenomena are unrelated to one another includes the lack of agreement in the timing of the development of coastal dead zones and the timing of these cyclic changes, which are evidenced in available records covering the last 50 years. Nevertheless, the relationship between climate change and coastal dead zones remains debatable. What's more, Barth says that whether and where dead zones appear in any particular year partly depends on the daily weather, which is difficult to predict. So the research team continues to study winds, ocean circulation, and the timing and locations of coastal dead zones in order "to collect enough statistics over time to determine whether climate change is, in fact, driving the formation of coastal dead zones," Barth says. Barth says, "I wouldn't be surprised if coastal dead zones appear every summer from now on because oceanic and atmospheric conditions are now primed for their regular, repeated formation. He adds that "the real questions now are: How big will the dead zones be? How long will they last? And how often will oxygen levels plunge low enough to cause marine die-offs?" 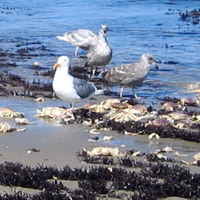 Next: New Ways of Taking the Pulse of Oregon's "Dead Zones"
Birds feast on dead crabs that washed up on the beach after suffocating in the low-oxygen waters of a dead zone in 2004. Along the coast of the Pacific Northwest, northerly winds together with the Earth's rotation drive surface waters away from the shore and pull up naturally nutrient-rich but oxygen-poor waters from the depths in a process called "upwelling." This nutrient-rich upwelled water fertilizes phytoplankton blooms. 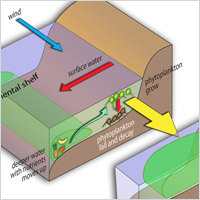 Some phytoplankton ultimately sinks and then decays through oxygen-consuming processes that cause low-oxygen zones to develop on the ocean floor. When southerly winds form, they work with the Earth's rotation to drive surface waters back towards the shore and to drive bottom waters away from the shore in a process known as downwelling. When sufficiently strong and frequent periods of downwelling interrupt periods of upwelling, low-oxygen zones are disrupted and therefore do not expand into near-shore waters. But since 2002, changes in winds and oceanic circulation and reduced oxygen levels of upwelled waters have expanded low-oxygen zones into near-shore waters. Tide pool sea stars feast on Dungeness crabs that suffocated in the low oxygen waters of a dead zone of 2004. 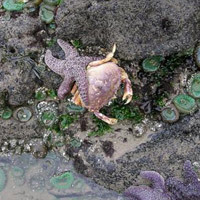 The diet of tide pool sea stars does not normally include Dungeness crabs. Blue shows where low-oxygen conditions developed (<1.4 ml/l) and purple shows where extremely low-oxygen conditions developed (<0.5 ml/l) in 2006 and 2007. Shoreline waters remain high in oxygen because breaking waves oxygenate water. Dots represent sampling sites.